The Community Energy Efficiency Program (CEEP) was established by the Australian Government to support local councils and community organisations in improving the energy efficiency of buildings, facilities and streetlighting as well as delivering community education. Under this program Council has received $468,755 to improve the energy efficiency of the Lismore Memorial Baths, the Goonellabah Sports and Aquatic Centre (GSAC), Council’s Corporate Centre in Goonellabah and Council’s former CBD office. At the two public swimming pools we have installed variable speed drive motors to improve the efficiency of pool pumps, energy efficient LED lighting and an evacuated tube solar hot water system at the Memorial Baths (GSAC already had a solar hot water system). At our Corporate Centre we are adding energy efficiency technology to the existing air-conditioning system as well as heat reflective paint to the roof. At the former CBD office we are installing a new, efficient air-conditioning system, and at both offices we will upgrade all lighting to LED. Combined, these energy efficiency upgrades will save Council $144,500 in electricity bills each year, equivalent to around 622,280 kilowatt hours or 658 tonnes of carbon dioxide emissions. Using CEEP funding, Council is proud to be the first local government in Australia to install a hybrid wind and solar-powered off-grid streetlight. The streetlight is part of a trial between Council and Australia United Energy to test the performance of a hybrid energy streetlight compared to traditional streetlighting. Council has partnered with the Lismore Community Sustainability Forum (LCSF) – a not-for-profit group run by volunteers dedicated to advancing sustainable living – to design and deliver community education on energy efficiency. The objectives of this program are to raise energy literacy levels and encourage behavioural change towards energy efficiency. Using the Sustainable Streets and Transition Towns model, first developed in Totness, England, LCSF will form several neighbourhood groups to deliver energy efficiency workshops targeting low-income households. To find out what you can do to reduce your energy bills, download our brochure Embracing Energy Efficiency: Tips for Saving Energy at Home. 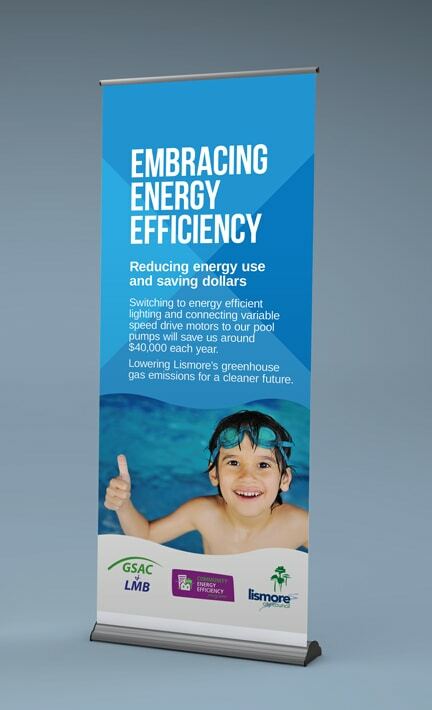 You can also view our educational presentation, Embracing Energy Efficiency. We use this to demonstrate the savings from the CEEP program and encourage other large organisations to follow our lead and embrace energy efficiency. For more information on our energy savings and how we achieved them, you can read our Embracing Energy Efficiency Fact Sheet and the Local Government NSW Case Study. In mid 2014 we installed solar hot water systems on 10 of our facilities – another step in our challenge to self-generate all electricity from renewable resources by 2023. There are three new solar hot water systems on community facilities: the amenities blocks at Gilchrist Oval in Caniaba and Balzer Oval in Dunoon and the Lismore Memorial Baths. There are also seven new systems on the following Council buildings: our Corporate Centre, Mechanical Works Depot, Water and Wastewater Works Depot, East Lismore Sewage Treatment office and laboratory, Lismore Recycling & Recovery Centre and Blakebrook Quarry. The 10 systems cost just over $31,000 after claiming back $8265 from Small-scale Technology Certificates (STCs), a solar credit scheme run by the Commonwealth’s Clean Energy Regulator. The systems were joint-funded by the Local Government Energy Efficiency Program. We know further solar hot water system installations will form part of our 2023 Renewable Energy Master Plan goal to self-generate all our electricity needs from renewable sources.